Ala Hamdan has won several national and international prizes when it comes to photography, and she organized several projects as well. Ala has also won in (Women and the City) photography contest held in Amman, and participated in a the Women's Day photography exhibition in Palestine and Jordan. Ala participated in several photography exhibitions held in Jordan and Palestine, she volunteered with the UN to encourage the concept on volunteerism and the video she made was published by the UNJo as the video on Volunteer Day 2014 where Ala was the Master of the Ceremony, and also introduced the video for more than 800 people in the audience. 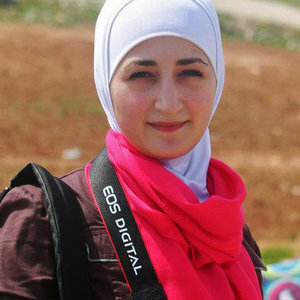 Ala does not only photograph for fun, she has photographed the less fortunate areas in the Palestinian and Syrian refugee camps in Palestine and Jordan, and her photos were used in several publications and social media means to deliver a message. Ala began an annual event (Every Ramadan) for women titled (Let's Photograph), more than 40 women participated in Ramadan 2013 were they walked around the capital Amman taking photos of random people and pedestrians during the day, the idea is to empower women who hold the welling to learn more about photography, to merge them with the local community and to break their fear. Along this project Ala organized trips to Zataari Refugee Camp in Jordan, and to local schools outside the city of Amman where she along with her friends taught the students photography, knowing that these students come from very poor families and areas and them holding a professional camera was a dream come true. Ala does not only represent herself, while wearing the hijab, holding the camera,respecting all different people around her and enjoying her hobby she has proven that Hijab is not a restriction. In a community where a muslim woman sometimes is expected to be quiet and sometimes her ambitions are rejected, Ala proved to women that they can be whatever they aim to, and that they are powerful! Ala being only 24 years old has done a lot for her community, not only as a photographer, as she is also an official teacher of Arabic as a second language, and a Spanish teacher as well. Speaking 3 languages helped her in getting to know more people and in delivering her message to people from different ideologies and backgrounds. Behind that camera stands a women who is religious, believes in God, prays 5 times a day, respects all people and enjoys her hobby, Islam does not forbid entrepreneurship. Ala works with refugees, she tried to come up with creative ideas to empower the children specifically. She knows they don't own cameras, but with her giving them a chance to be photographers for one day, she had shown them different aspect of the world beyond their tents. Children were asked to think of places where they would like to take photos at, mostly responded (The hunger in Africa, the war in Syria, and the occupied Jerusalem), when Ala told them how about the mosques in Malaysia, the Islands of Indonesia and the jungle on Africa, then she showed them photos, they were astonished, and they were from that point eager to know more about the world. Ala truly believes the world should learn how to coexist, there are many religions, beliefs, thoughts, ideas, and if we all fight to prove our ideas, the world will never live in peace. When Ala takes a photo of the Kabaa, publishes it and then people meet the person that took this photo, they can finally connect between Islam and Art. When they meet Ala they can also connect with a confidant muslim woman who delivers messages with her photos to the whole world. Ala will never stop from reaching to the world to know more about Islam. Using her ability to speak 3 languages, and flexibility to travel around the world carrying on her shoulder a camera, she will definitely with God's guidance deliver a strong message. Ala would like and will keep working on correcting the image of (Muslim Women) around the world, she wants to change the idea many western countries has that she is living in shades, and denied all her rights, Ala wants to be a living proof that Islam is a religion of peace and justice, and that it has given women all the right to be creative, artistic, and an entrepreneur. Her photos will never stop from speaking the truth, and her voluntary work will be one of the means that will help her do so.